As builders prepare to break ground on The Goods Line, Sydney’s version of the ‘High Line’ in New York, the NSW government has unveiled plans for the next stage of the cross-city corridor. Designed by Aspect Studios with Choi Ropiha Fighere, The Goods Line is a government initiative seeking to build on the 500 metres of industrial railway track currently dividing Ultimo from Haymarket, and create an Ultimo Pedestrian Network, or UPN – The Goods Line. Built in two stages, the northern section of the line will connect the new UTS Dr Chau Chak Wing Building designed by Frank Gehry to the Powerhouse Museum. Construction of the northern section of The Goods Line is due to begin next week (24 March), with the contract awarded to Sydney-based builders Gartner Rose. It is scheduled for completion in November 2014. However, the government is already looking ahead, with completed design concepts released by the Sydney Harbour Foreshore Authority (SHFA) for the project’s second phase – The Goods Line South. This second stage will provide a makeover for the existing pedestrian route from Central Station through to Darling Harbour, and is expected to go to tender late this year, with construction starting early next year. The corridor will feature a series of elevated spaces or platforms which are bordered by pop-up bars, cafes, performance stages, ‘study pods’ and electronic screens. “The Goods Line turns a disused rail freight corridor into a fantastic people area, stretching from Railway Square through Ultimo to Darling Harbour,” said Planning Minister Brad Hazzard. 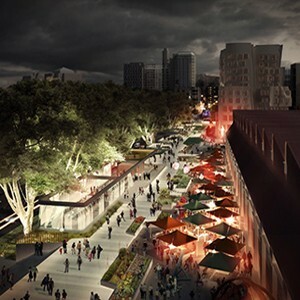 The strategically planned link will connect with arts, education and cultural institutions along Sydney’s Cultural Ribbon. SHFA is leading the project, which is expected to create a new urban hub and connect more than 80,000 tertiary students, locals and visitors to major attractions in Sydney’s Darling Harbour. A feasibility study has been flagged by transport minister Gladys Berejiklian to extend The Goods Line through to Mortuary Station and Redfern, in line with the government’s recently announced policy, Sydney’s Walking Future. Images: Aspect Studios. Source: SHFA.